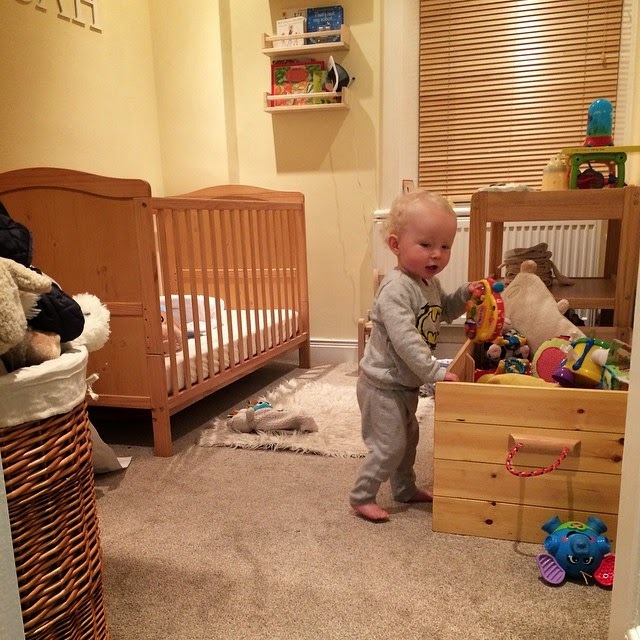 Your once spotless home is transformed into a cluttered shambles the moment you become a parent, or atleast mine did. 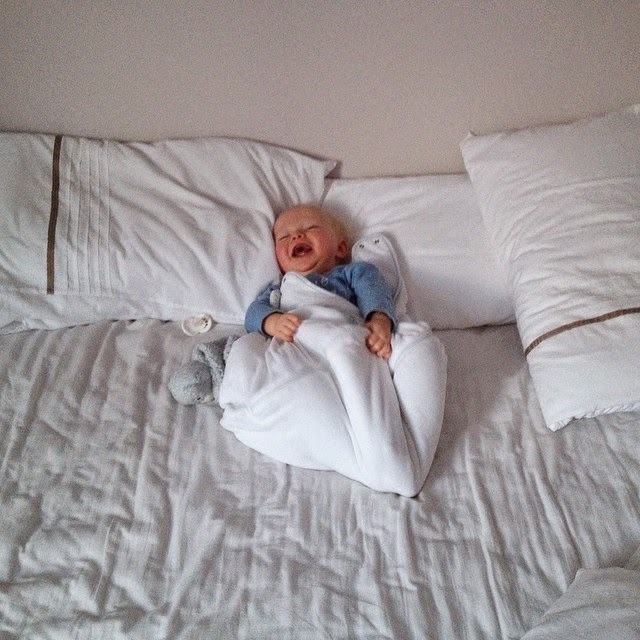 Everyone tells you how hard babies are to look after, how expensive they are or how they will never let you sleep again but no one actually warned me how their belongings will take over the entire house. 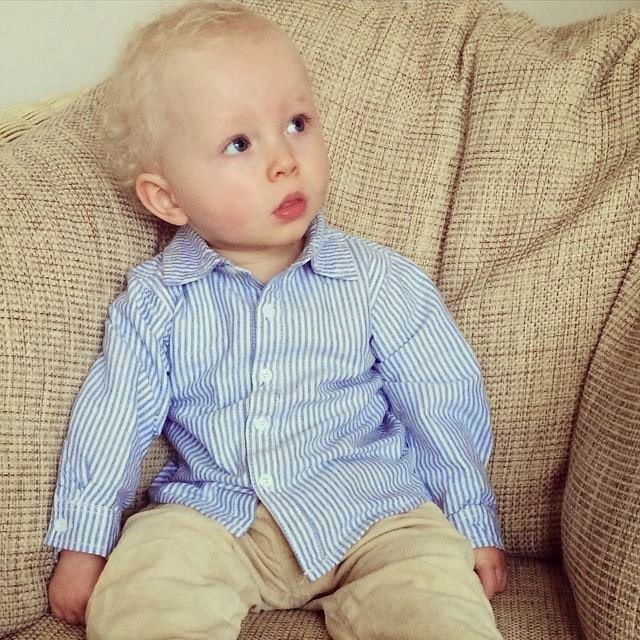 Why does the baby have more clothes than Mummy and Daddy put together? How have they ended up with a different teddy for each day of the month? They have so much stuff! 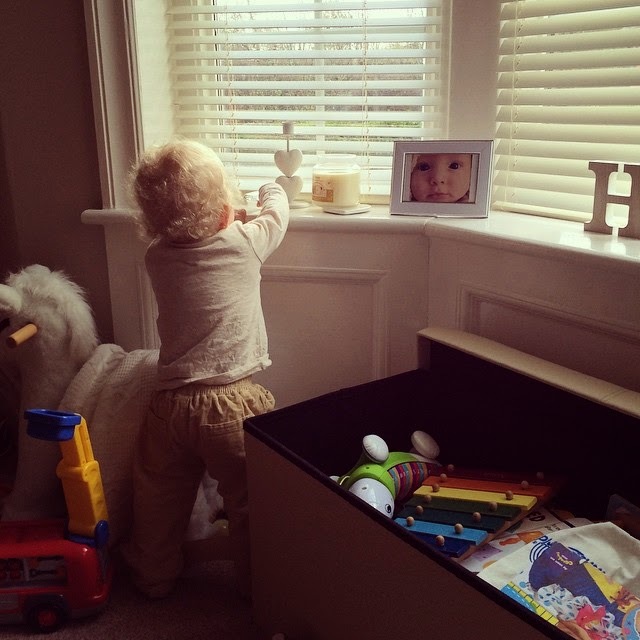 When we bought our first house early last year we agreed to make it the best home that we possibly could, we want the perfect home for Noah to grow up in. We want everything to have it's own place and have some sort of organisation amongst the chaos. Noah's toys do take over the house but with the help of added storage in every room the house is looking less like a Toys R Us explosion and more like a home. At the moment Noah has two toy boxes. One is downstairs in the living room and the other is in his bedroom. I knew I wanted to have some extra storage in his room to display his vast collection of Teddy's and The Basket Company came to my rescue. They saw my tweet and kindly emailed me to ask if I would like to review one of their baskets. 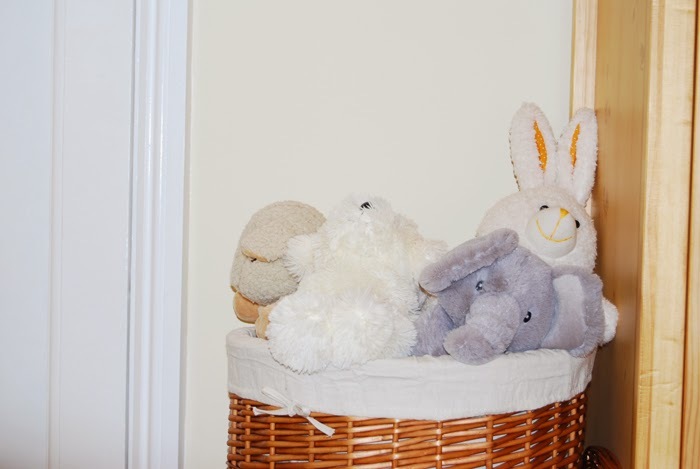 I wanted to choose a basket that would fit in with the colours of Noah's room. 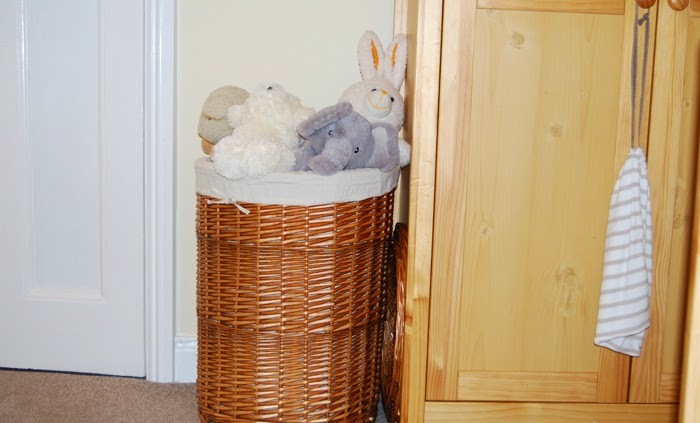 I had what I wanted in mind when I was browsing through the laundry basket section and chose the Natural Round Wicker Laundry Basket in medium which would match his pine furniture and warm coloured walls and carpet. When the basket arrived a few days later it was everything that I had wanted. It was the perfect colour to match the room and it was just the right size to fit in the nook between the wardrobe and the door. It is very well made and a generous size. It contains a liner which is great because it protects any items from damage from the wicker. I like how you can remove it to wash it too, that's always a plus. There is also a lid to the basket but I chose not to use it because I wanted to show off the teddy's inside. 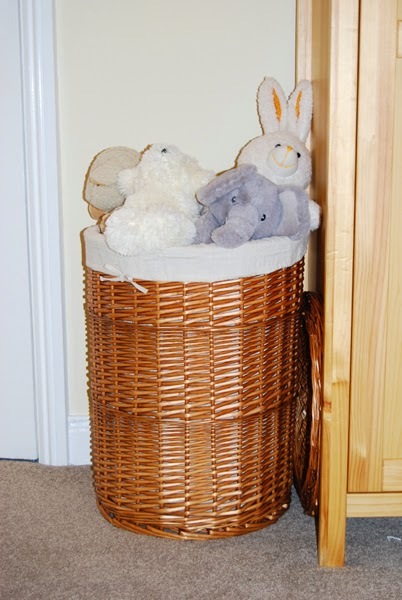 We are very happy with our basket from The Basket Company and wouldn't hesitate from buying from them in the future. No matter where they happen, natural disasters have a devastating effect on communities. But when a 7.0 magnitude earthquake struck Haiti, one of the world’s poorest countries, the impact was nationwide. With the centre of the earthquake in the capital Port-au-Prince, the core of the country was virtually destroyed, water sources were ruined, roads crumbled and hospitals and important community services thrown into disarray. In total over 3 million people were affected by the Haiti earthquake, and though the international community responded with aid efforts immediately the scale of the disaster meant that recovery would be a long time coming. But now, five years on, with the rubble cleared away life in Haiti is returning to normality. Because the effects of the Haiti earthquake were so far reaching efforts to help people adjust and recover have touched on practically every part of everyday life. * Emergency Aid. In the immediate aftermath water, food and shelter had to be provided as people’s homes were left in ruin and the nation’s infrastructure was left in ruins. * Child Protection. Huge numbers of children were left orphaned, displaced and vulnerable by the Haiti earthquake. In natural disasters children are more likely to die and have an increased risk of exploitation. The creation of facilities where children could be kept safe, allowed to play, and receive care and support was vital. * Rebuilding Schools. Across Haiti schools were closed, either due to damage to the buildings or as a result of the chaos surrounding the earthquake. Work to rebuild damaged and destroyed schools has resulted in not only a return to education for children but an increase in primary school attendance. * Supporting Girls And Young Women. During a natural disaster girls and young women are at increased risk of abuse and sexual exploitation due to their lack of power and rights.1 To ensure that this vulnerable group were protected measures were taken to address their specific needs. Projects like the creation of youth clubs for women and girls gave a safe physical environment and also allowed girls to learn vital skills. 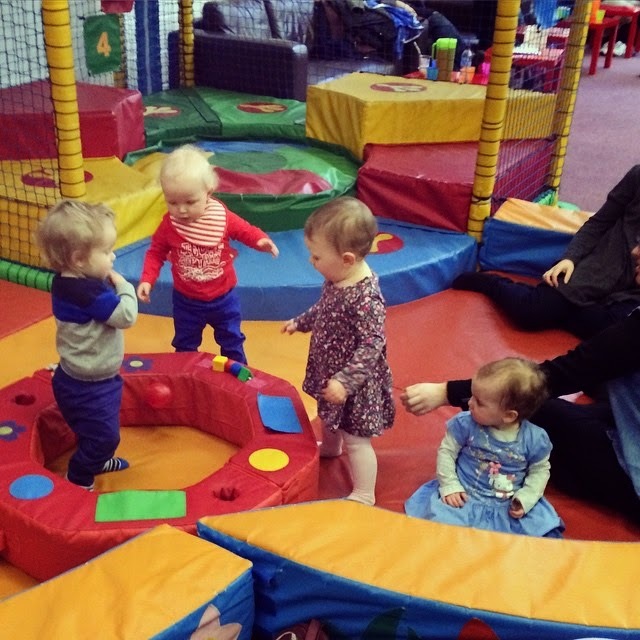 When Eva heard about such a club in her community she went to it immediately. She had been living in a tent with her family and relatives. “This project has rebuilt us…it took us from a state of vulnerability to a state of independence.” Eva now runs a sewing workshop and is totally independent, no longer reliant on her husband’s income. 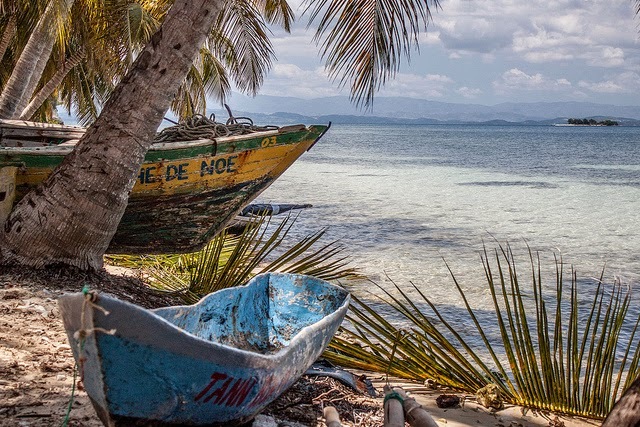 Although Haiti has made an incredible recovery it remains in a precarious state. Economically the nation remains very poor, with high levels of poverty and infrastructure that fails to meet the needs of its population. Plan UK continue to carry out essential work in the region. Make a donation to their fund and help the people of Haiti enjoy the future they deserve. Ever the cheeky monkey, there isn't a day that goes by that he doesn't make us giggle. He has always been such a character. He has been going through a big long leap this month and it says that one of the traits you show during this development leap is defiance and he is certainly living up to it. Noah has really started testing his boundaries and rarely listen to my instructions anymore. 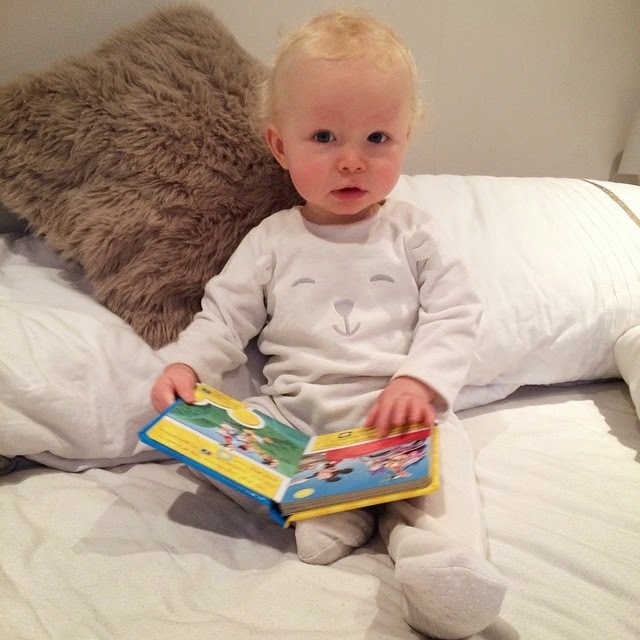 It's all part of learning and we will get there, little monkey! I really need to get Noah weighed soon. I have no concerns but I would just like to know where he is percentile wise. 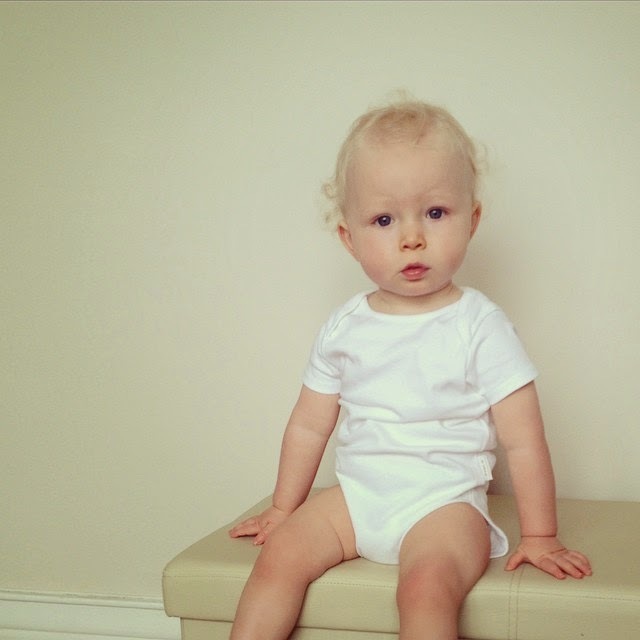 He is wearing a mix of 9-12 month and 12-18 month clothing. He's very slim built and long. He was wearing size 4 nappies but is now in BTP cloth nappies. Noah has always been a great eater but as soon as he started going through his current development leap he went off his food a little. He started picking at food, only eating certain bits and was gagging really easy on everything. It could be the leap but it could be to do with teething too? Maybe a combination. The past week he has been fine though and is pretty much back to how he feeding before. He now tries to use a spoon and fork himself which is really cute. 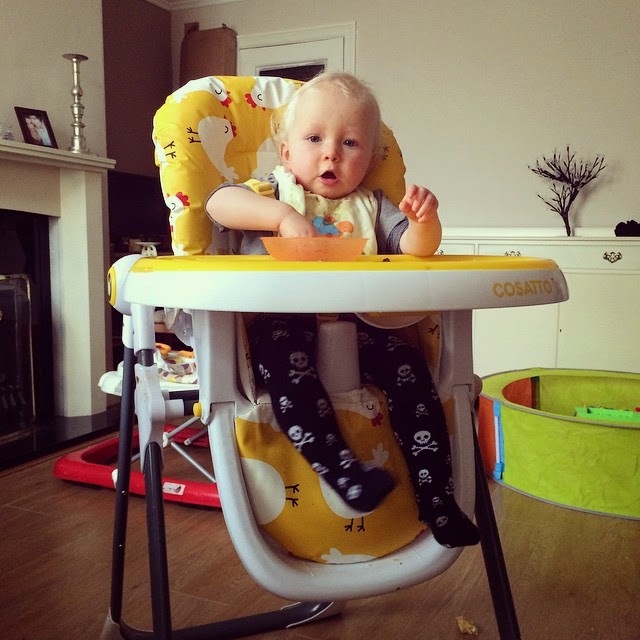 He also likes to have his own bowl and will always tidy up his high chair tray by putting lose morsels of food back into his bowl. 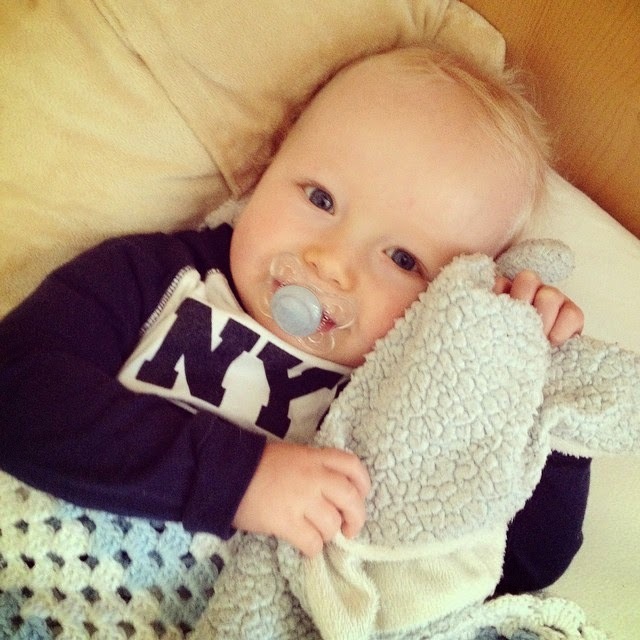 He is still having three bottles of cows milk too, 8oz in the morning, 5oz in the afternoon and 8oz at night. We've had a good month sleep wise, a few nights hit or miss. Generally bedtime is 8pm and he will sleep through till 8am - 9am. Sometimes he will go to bed a little later and sometimes he will wake at 6am for his morning bottle and then go back to sleep. Naptime is good too and we've had no naptime drama for a while. I have found the past week or two Noah has been waking up in the morning a little later so the past two days we've cut out the mid morning nap and are just having one longer afternoon nap. It's going okay for now but we will see. 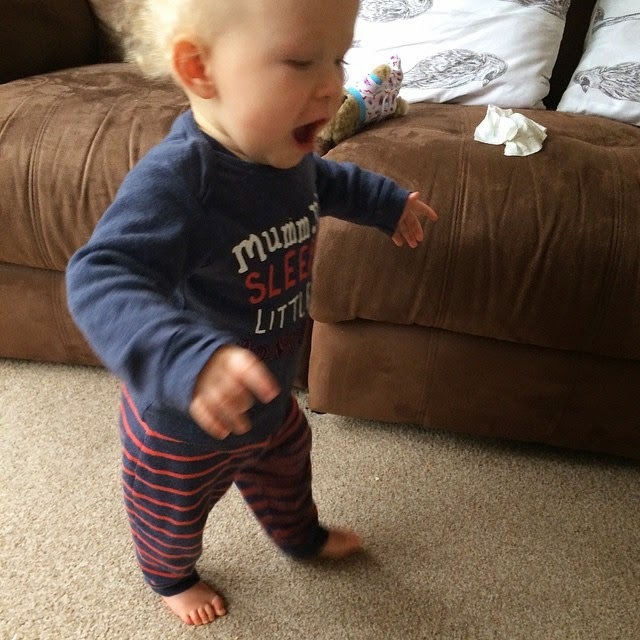 Walking - Today at 14 months and 7 days Noah took 6 steps, then did it again and again! This is the most he has ever done and I think this is it now. I think by next month I will be writing that he is walking everywhere. 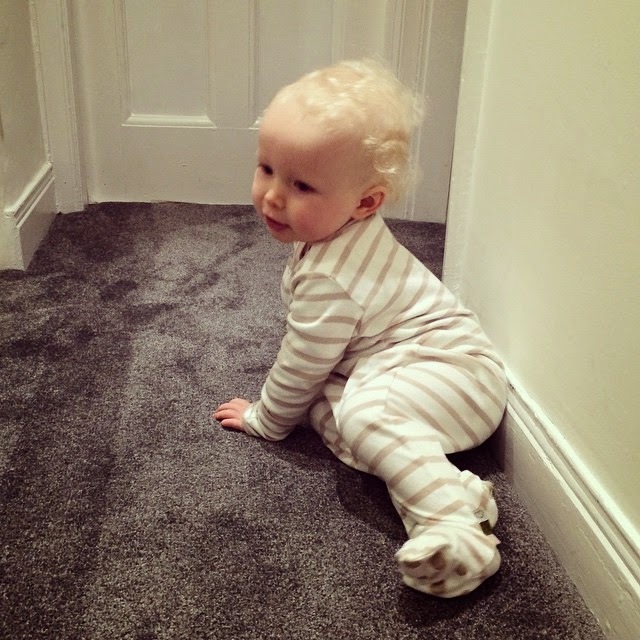 I find it strange that he learnt to walk at 14 months just like I did. I still get goosebumps just thinking about it. Mobile - He seems to be able to climb down off things a lot more efficiently this month and is a lot more steady at doing everything. Talking - Noah is really coming on with being vocal, he tries to repeat every word that you say and I have noticed that he will look at something and say what it's called. 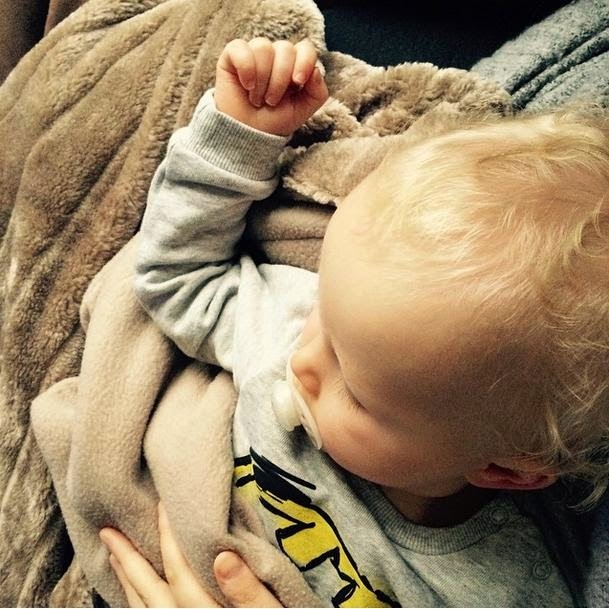 The words he knows are; Mama, Dada, Dad, Daddy, Nan, Nanna, Jake, Mickey, dirty, hiya, and light. Understanding - He understand so many things that I say to him now and it surprises me on a daily basis. I ask if he wants to have lunch and he will crawl off into the kitchen. If I ask him if he wants a bath he will head for the stairs. He now pretends to talk on the phone a lot which is very cute! 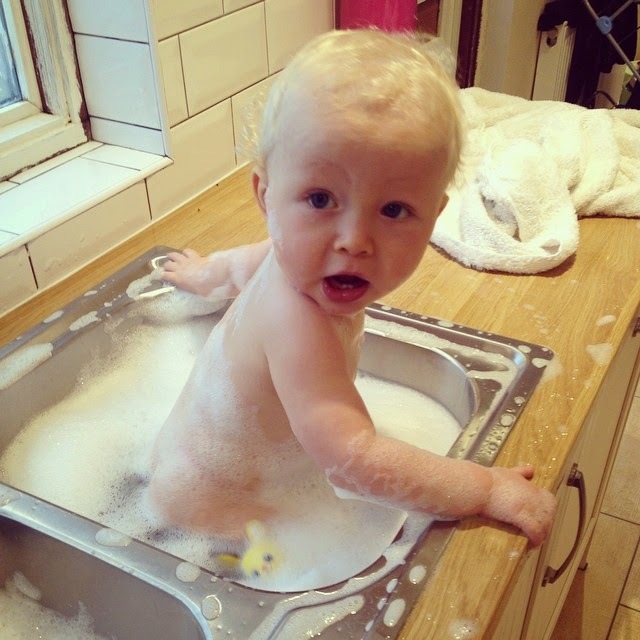 He also likes to try help clean up with a wipe and tries to put his own nappy on. Feeding. He is trying to use his spoon and fork a lot more this month and is getting there but sometimes gives up and uses his hands instead. Pretending to talk on the phone. "Hiya, Dad?" "Bab?!" He say's Bab all the time and I have no idea what he are trying to say but it must mean something to him. Stacking and tidying. He is always stacking objects or putting items in things. He loves to tidy up or put the bits of food that have fallen out his dish back into it. Disney Jnr. The channel drives me nuts but he does insist we put it on a lot of the time. He will pick up the remote and give it to me. Being applauded. One of his favourite things is to have everyone applaud him. He will sit there clapping with you with the biggest smile on his face. Pointing. He has always been a pointer but now he will point at all the different parts in books or at the TV so that you tell him what those things are. Books. He loves looking through his books and pointing at all the different pictures. He doesn't really have the patience to sit there and let you read a page though. By the time you are on the second word he is already turning the page over. Gadgets. Still obsessed with phones, ipads, remotes. I have to hide them otherwise he totally fixates on them. Being told no. Which every toddler on the planet dislikes too. 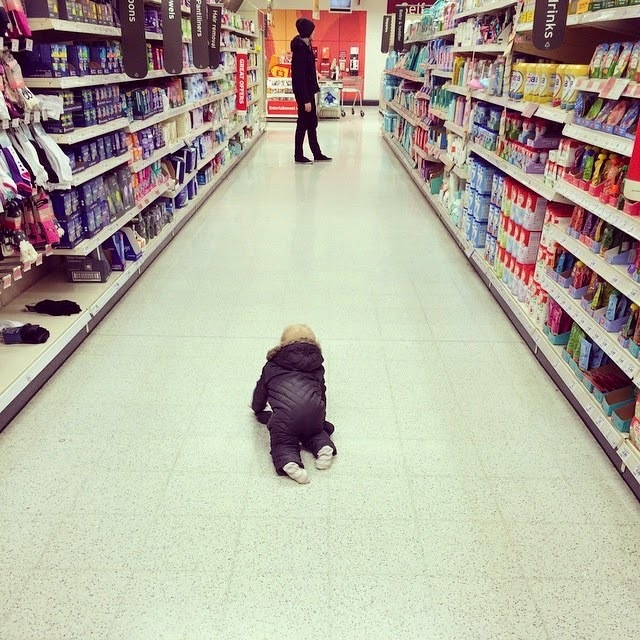 When I tell him no or ask him not to do something he usually cries his eyes out like I have just gone and broke his heart. Not being able to reach something himself, he gets so frustrated. Here is some more baby spam! Enjoy! 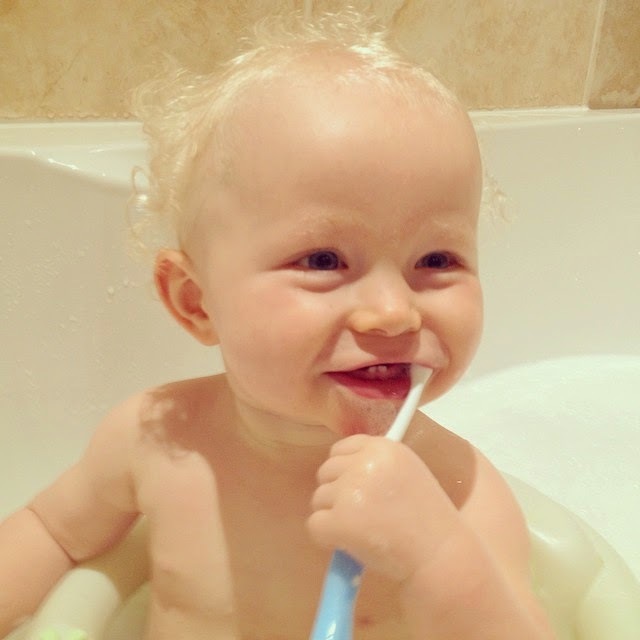 Noah loves having a bath, it's one of his favourite things to do. When you tell him that it's time for a bath he will stop whatever he is doing and crawl to the bottom of the stairs ready for us to take him up. He will then stand at the bath excitedly as it fills with water and bubbles. We have amassed quite the collection of bath toys over the past year and I don't think Noah could ever have enough. 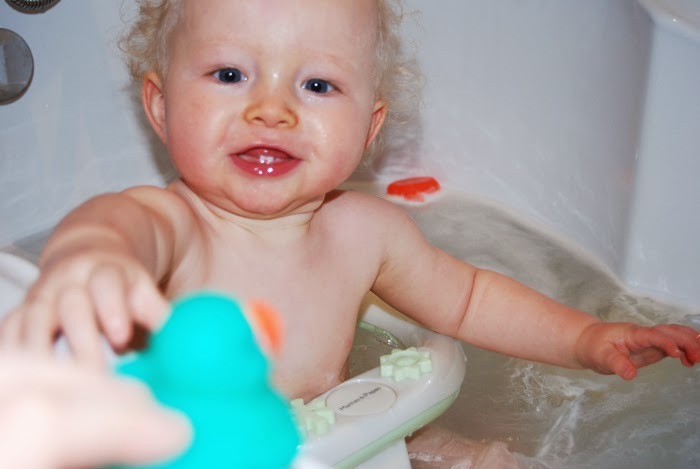 I think he would fill his bath with bath toys instead of water if he had the option. 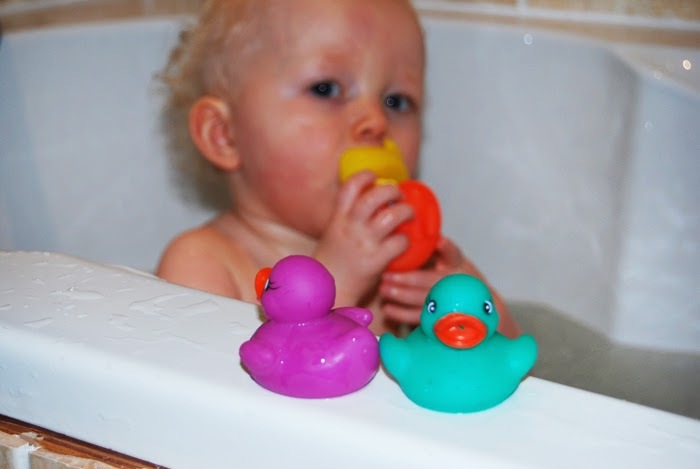 We were recently sent a pack of 4 rubber duckies from H&A for Noah to try out and as soon as I saw them I knew they would be a hit. 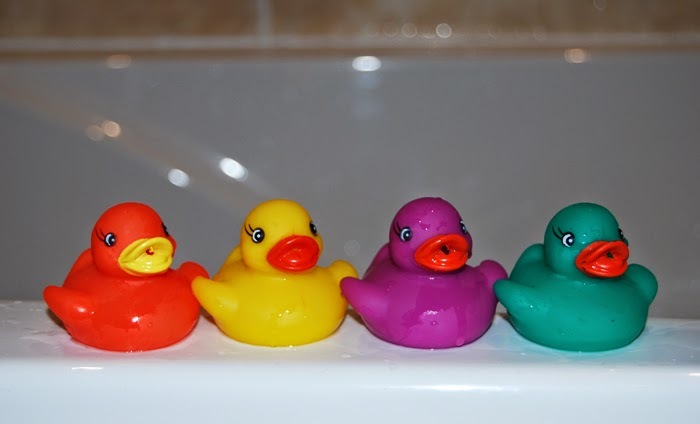 These brightly coloured squirting ducks will attract every toddlers interest with their deep hue's and cute faces. They are also just the right size for those pint sized hands too. Rather than filling them with water and squirting them he would pop them into his mouth like a big duck shaped dummy. 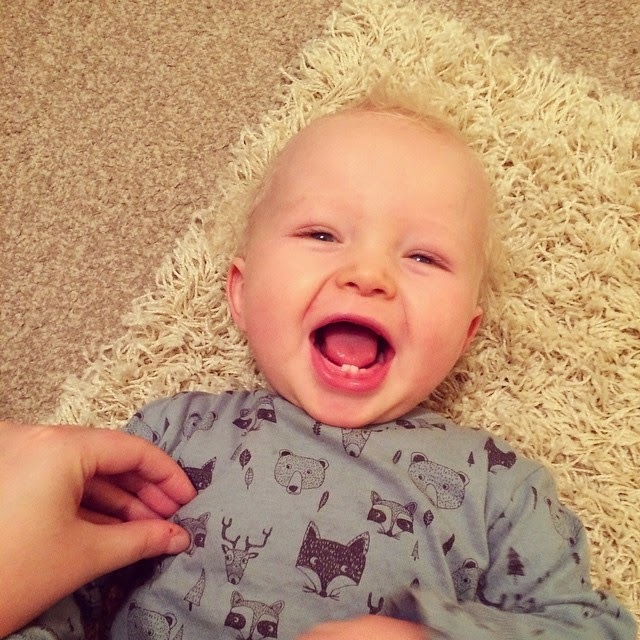 He is teething at moment so I think gnawing on the phalate free plastic felt good on his gums. 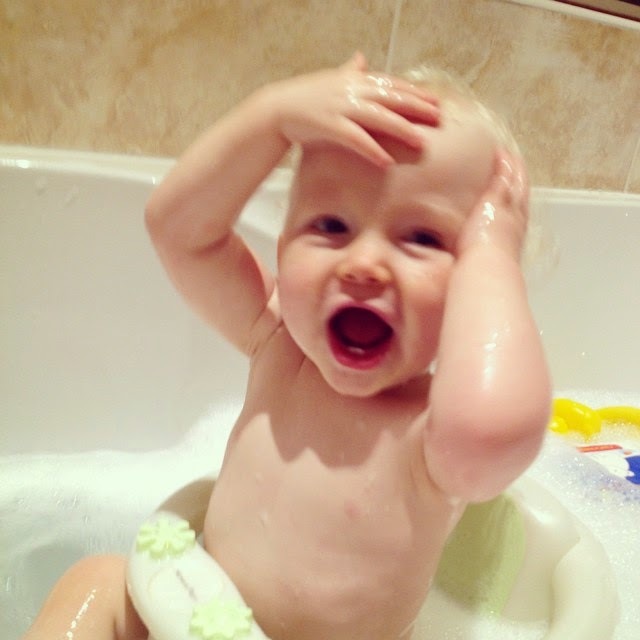 Noah also liked throwing them about in the water, throwing them at me and throwing them out of the bath! Little monkey! 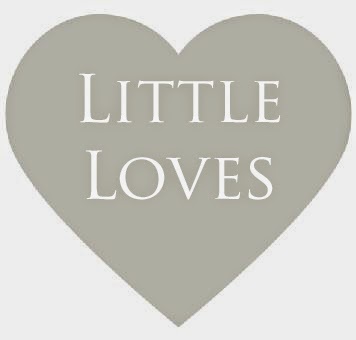 I think they are a great bath toys and at just £2 for the set they are an absolute bargain. Another week has flown by in the blink of an eye. Here is my 4th week filled with some of my little loves! I promised to start reading a book last week and have I? Nope. I'm kicking myself. I promise I will start one soon but I am struggling find time to do anything at the moment. I certainly need to learn how to priorities my time better. 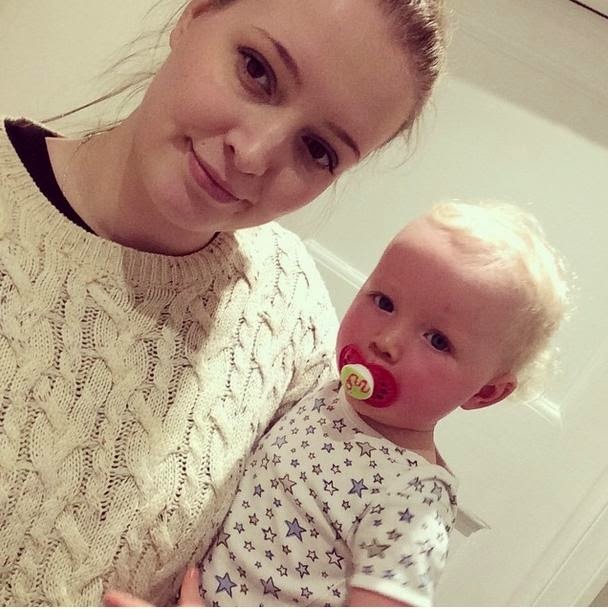 I did however read a couple of really thought provoking posts good friend Hayley from Sparkles and Stretchmarks this week. One of my favourites being "My social media detox." I say favourite because I can totally relate to that post and I really need to take a page out of that book myself. I'm still hooked on Celebrity Big Brother and I can't believe how much drama there has been this year. It's emotionally draining for a viewer to watch nevermind those poor folks living in there. I have also been watching American Horror Story which is as crazy and disturbing as ever. 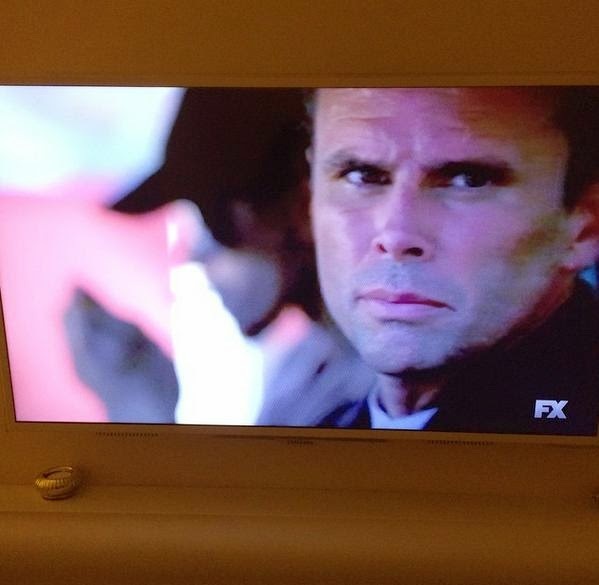 The final season of Justified has just begun too so that's something to look forward to each week, I love that show. I haven't been wearing anything interesting really, nothing new to report on other than my usual thick knits and leggings! It's far too cold to be even thinking about wearing anything else. A little of the same for Noah really. 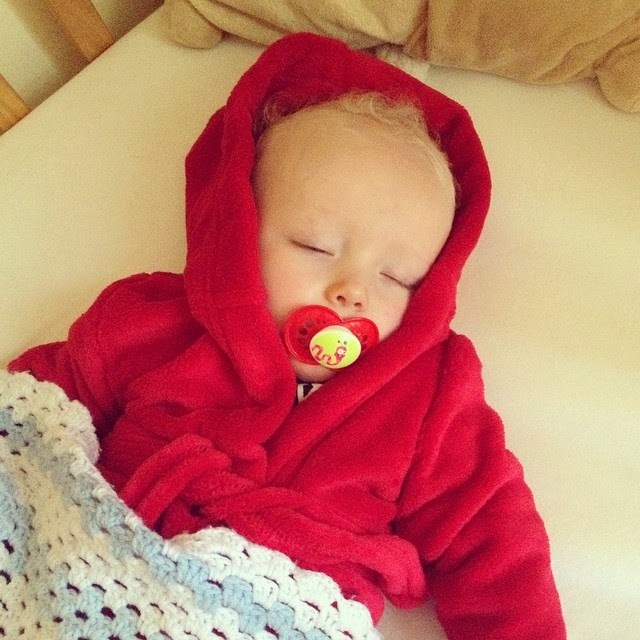 He has been under the weather he's been wearing babygrows during the day because I didn't want to be having to faff about with outfits when he's isn't well. It's all about being comfortable when you are poorly. He has also been rocking lots of cloth nappies this week! 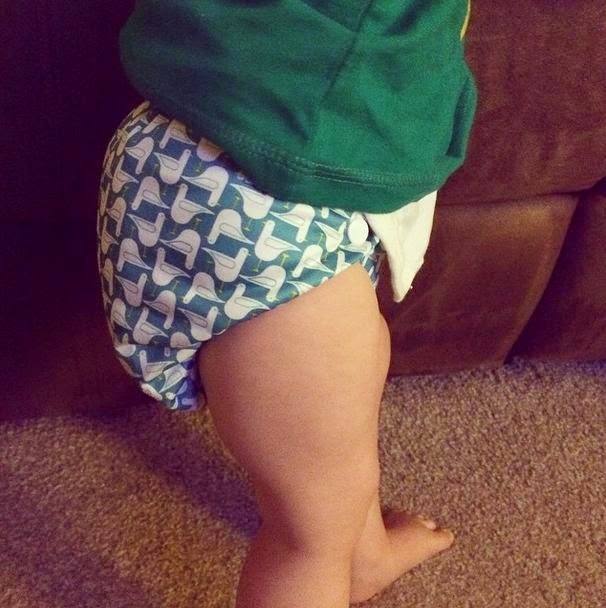 I wish we had started our cloth nappy journey a lot sooner but better late than never. Noah and I are both obsessed with Uptown Funk. Bruno Mars and Mark Ronson always seem to get it right! We've been singing and dancing to this song a lot this week! 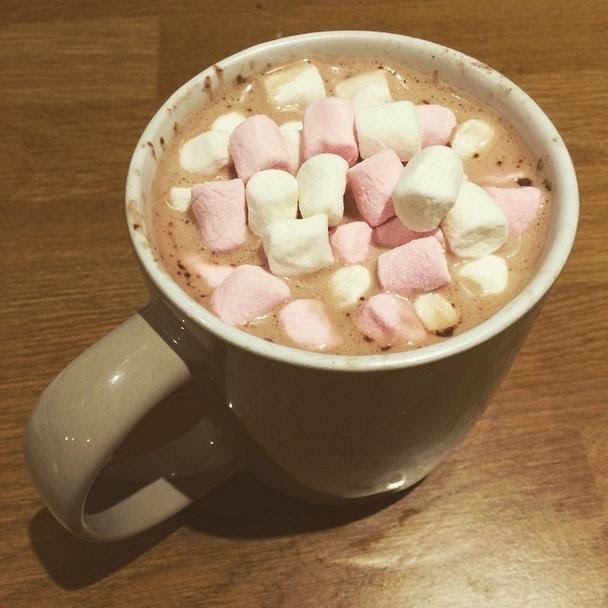 Lots and lots of hot chocolate! I'm not usually a hot chocolate person and usually drink latte's or tea but I can't seem to get enough. It's got to have marshmallows though! 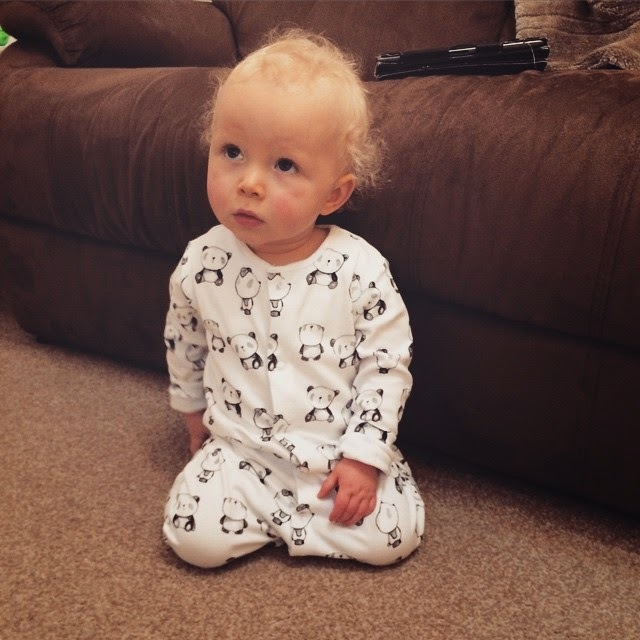 Post by Jenna Kate Parrington. How has it been 4 weeks already? This year is flying by! I have been getting on really well with 365. I thought I would because I am always snapping away but what I didn't expect was how Project 365 would inspire me and challenge me to take better photo's. I am enjoying it so much! 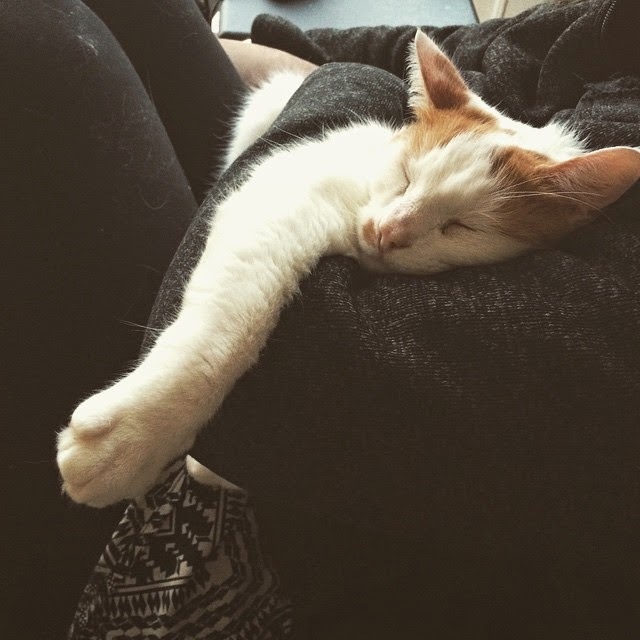 I had a baby free afternoon so my cat decided to play the role of baby and pretty much prevented me from doing anything. There are no words, he's such a little love. I rehomed a cat and had to make a late stop at the shops. I was a bad Mummy having Noah out past his bedtime but he didn't mind. I just had to let him crawl for a second just to get this photo. Noah officially started walking today and I couldn't of been happier! I cried, smiled and laughed. It was a lovely day. 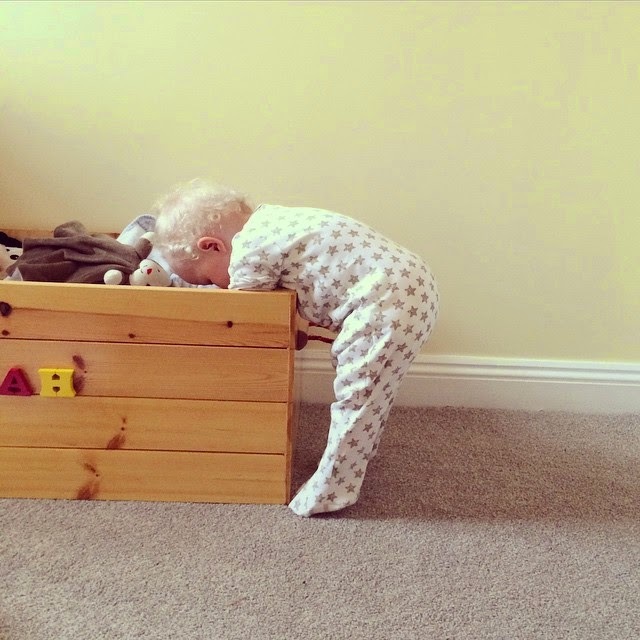 I love this photo of him rummaging through his toy box in his bedroom. Here he is throwing most his lunch on the floor! Do you see a reoccurring theme in my photo's? I will give you a clue, it begins with N! 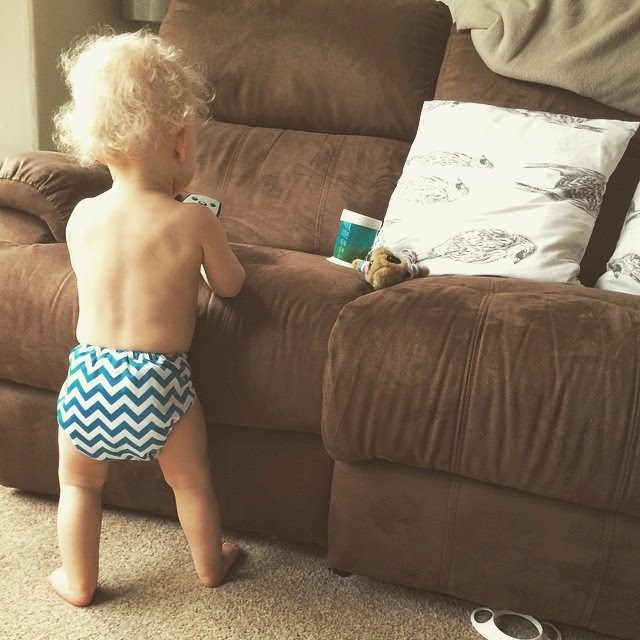 We've been using cloth nappies since the start of the year and we are such big fans. I wish we had started earlier but better late than never. We went to the park and for a walk. 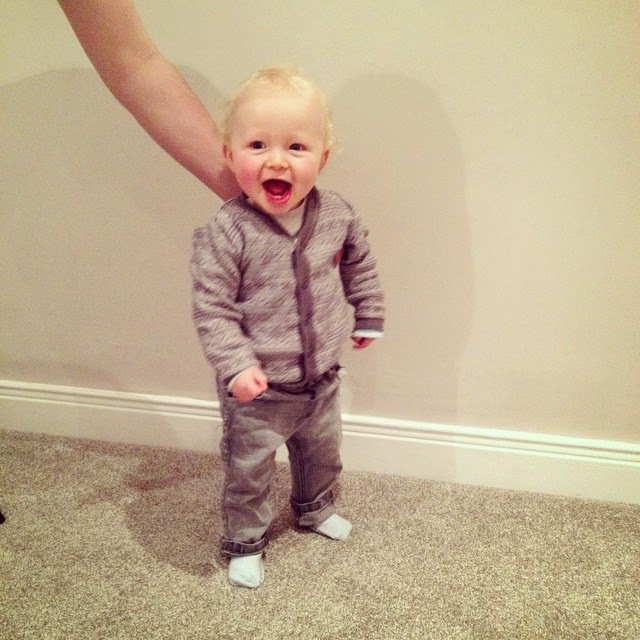 This was Noah standing unaided outside for the very first time. As soon as I took this photo he fell face down into the grass but he didn't mind at all. Noah is smothered in a cold and I look like I haven't slept in a year but these cuddles are priceless. Now don't get me wrong I am no expert when it comes to photography and don't claim to be either. I did study photographic media at college and gained a national diploma but to be honest I have pretty much forgotten most of the tips that I learnt while on the course. That being said I love taking photo's wether it be on my DSLR or iPhone and there isn't a day that goes by where I don't take a photo. Lighting - Light is the key aspect to taking a good photo. You need to have decent light to create the clearest image possible. I have a love/hate relationship with light for this reason as a lot of the time I snap a candid shot and it's perfectly timed but the lighting is terrible making the quality poor. Composition - This is my favourite part of photography as composition is a fantastic way to express yourself. You can take a photo of the most boring subject imaginable but if you get your composition and angle right you can change what would of been a run of the mill photo into something spectacular. Subject - Experiment with subject matters! Of course pointing you camera at something beautiful will make a beautiful photo, that's pretty obvious but I find that taking photo's of a subject that's a little different or even overlooked always makes an interesting image. 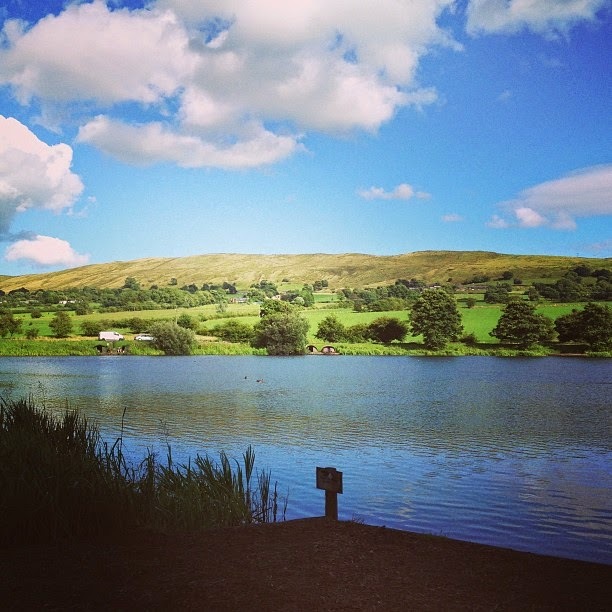 Medium - What do you take your photo's on? I use a combination of both my iPhone, compact camera and DSLR. It does get confusing taking photo's on so many different mediums but I do have some sort of system. For everyday images I tend to use my phone or superzoom camera as they are convenient and easy to use. For occasions I dig out my old DSLR and have my other cameras on hand too. Snap away - Take as many photo's as possible. It's better to have too many and get the shot rather than not enough. I find my favourite photo's are actually the ones that aren't posed and have been caught in the moment. For me photography isn't about being clinical, all about apertures and shutter speeds. It's about pointing, clicking and having fun! Noah has been taking the odd few steps here and there for the past few weeks but yesterday he officially started walking and we couldn't be any happier! It's taken a while but he got there when he was ready. 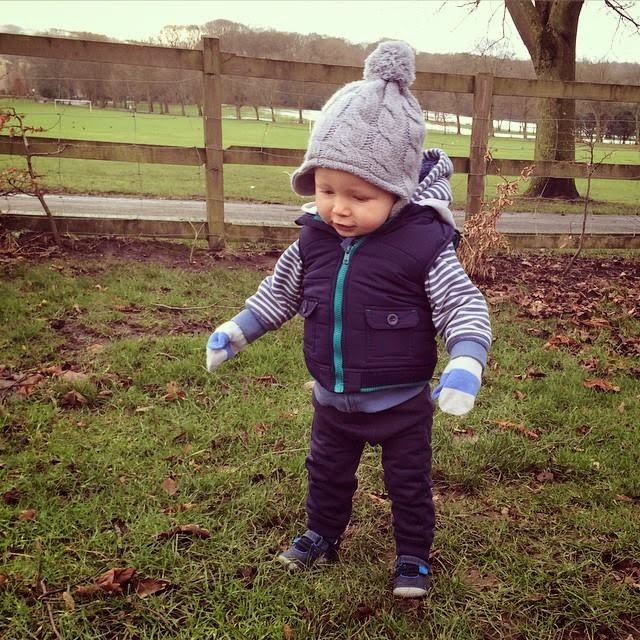 I kind of like the fact that he learnt to walk at 14 months because that was the age I learnt to walk too. 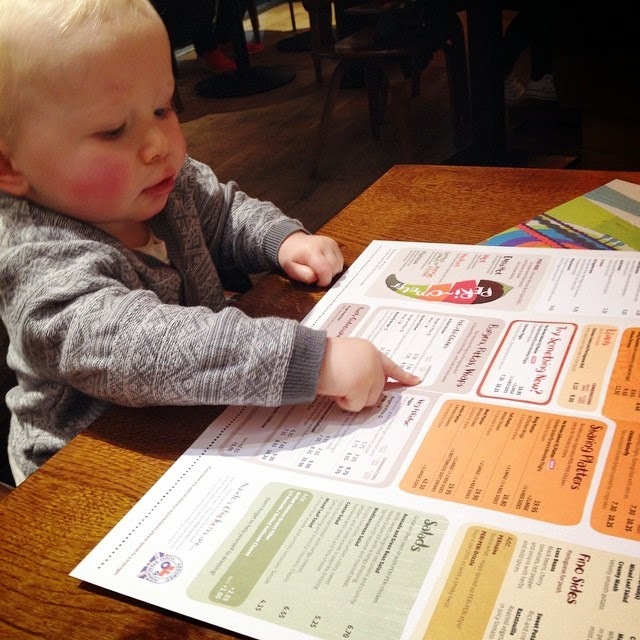 He's following in his Mummy's footsteps, literally! Here is the moment he set off walking and he hasn't looked back since. I am so happy that I caught the moment on film, I'm going to treasure it. 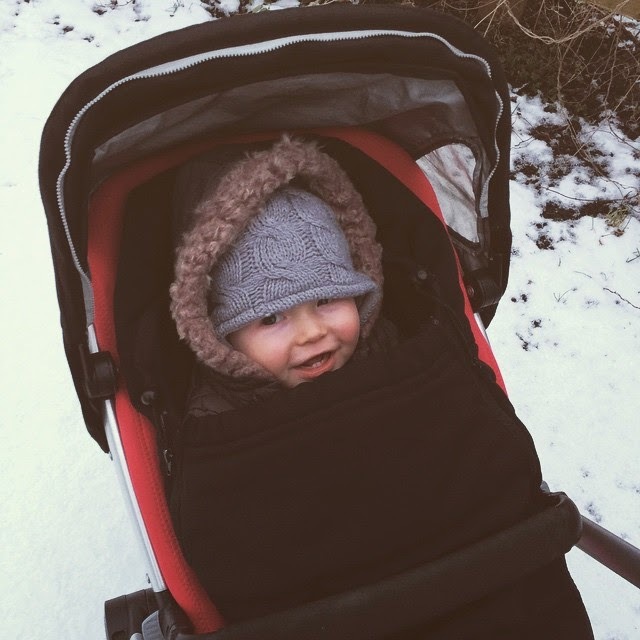 I'm not usually one for snow but last week when I finally saw it falling I couldn't contain my excitement because I was finally going to be able to show Noah his first glimpse of snow! I knew he would love it as he always notices things that are different or have changed and he loves being outdoors too. 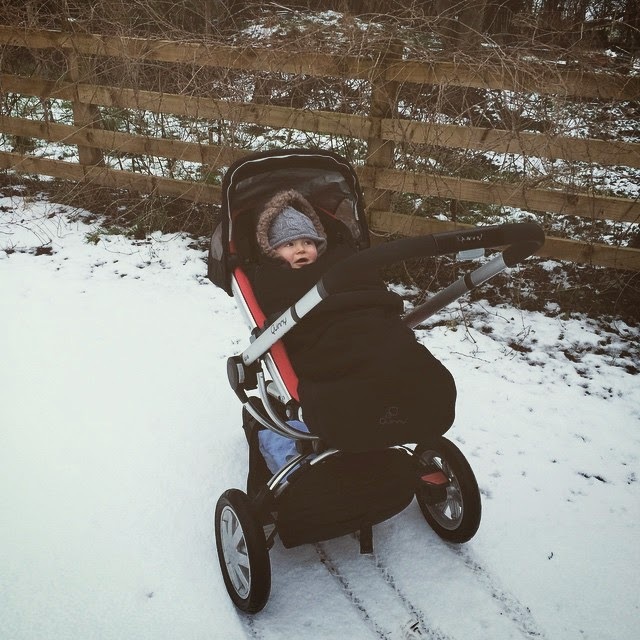 As he isn't walking yet he sat snug in his pram whilst I brought the snow to him, all while trying my best not to slip over. It was a lovely afternoon and as you can see he liked it too. I'm a little late this week but better late than never. Here are my loves from this week. Read - Again I haven't read or started reading a book this week and this needs to change. I used to always have my nose in a good book but I struggle to find time these days. There needs to be more hours in the day. I promise to start a book before the month is over! Watched - I have been totally hooked on the american drama show Justified but after so many marathons I have now caught up. I've been having serious withdrawals but the new series starts in just two days, yay! I have also been watching Celebrity Big Brother and have become slightly addicted! How crazy is it this year, seriously?! 2 people have been kicked out, 1 person has walked and 1 person has been evicted. Perez Hilton is totally driving me insane. He doesn't seem right in the head in my opinion and I find it slightly worrisome that he has a small child. Wore - I'm still wearing my trusted thick knits and cosy leggings and I don't see that changing anytime soon as it's far too cold to wear anything else. Noah outfits are a lot more interesting than mine and he's worn some super cute things this week. 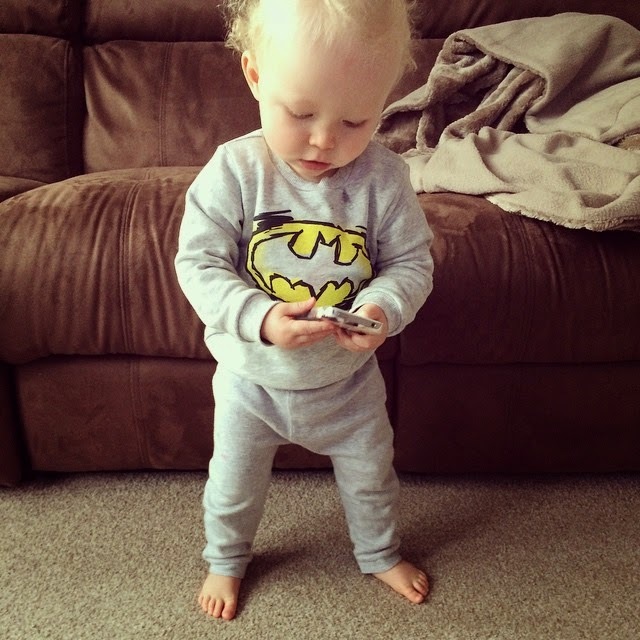 My favourite being his new lounge wear which consists of a soft jersey batman sweater and grey joggers as they look so comfortable! He has also been wearing pieces from his Box Upon a Time box which I will be blogging about soon. 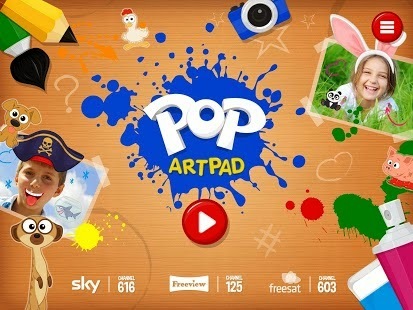 Heard - Disney Jnr - Get up and dance. Noah is a Disney baby and if the channel is on in the background he's happy. He loves Mickey Mouse Clubhouse, Jake and the Never Land Pirates and Sophia the First. He has never really been a fan of being in the car so a few weeks back I picked up the Disney Jnr CD and we now play it every time we are driving. Safe to say Nick and I know the words to every song on that CD already. 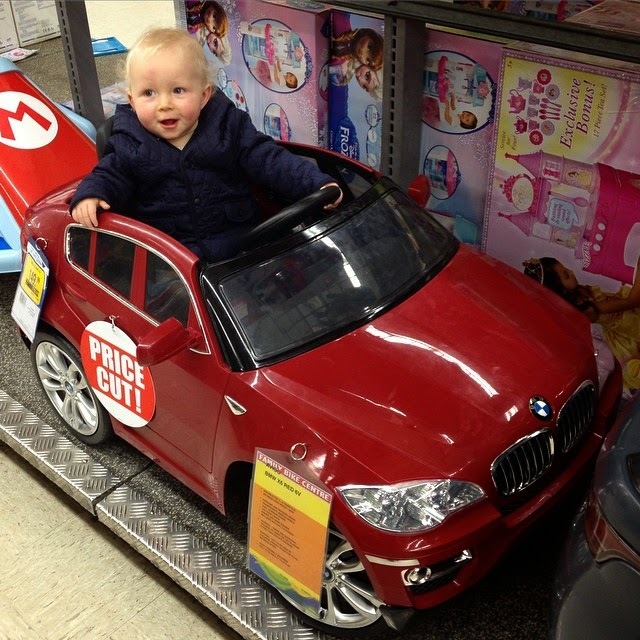 It does drive us a little crazy but anything to keep Noah happy whilst we are in the car. Made - I've been enjoying a spot of baking this week and whipped up my first ever batch of chocolate brownies last night. For a first attempt I thought they were really good and I am going to start experimenting with different ingredients and flavours. What is your favourite type of brownie? And lastly - Snow! 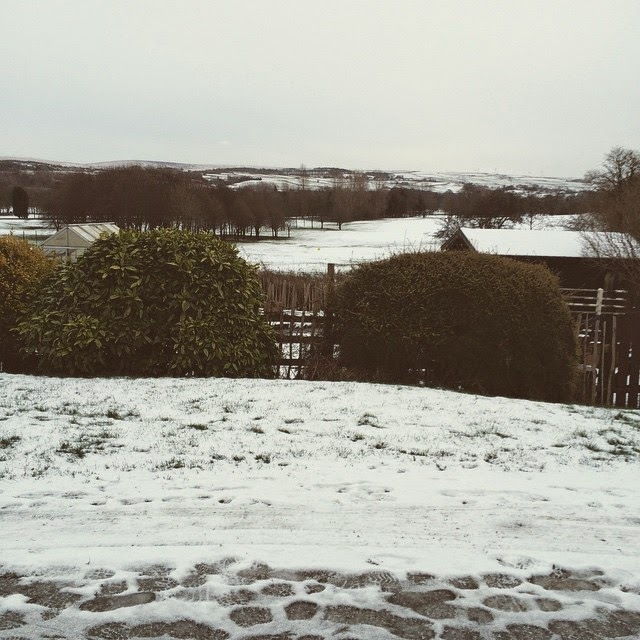 We have been lucky enough to have snow pay us a visit in the north west. 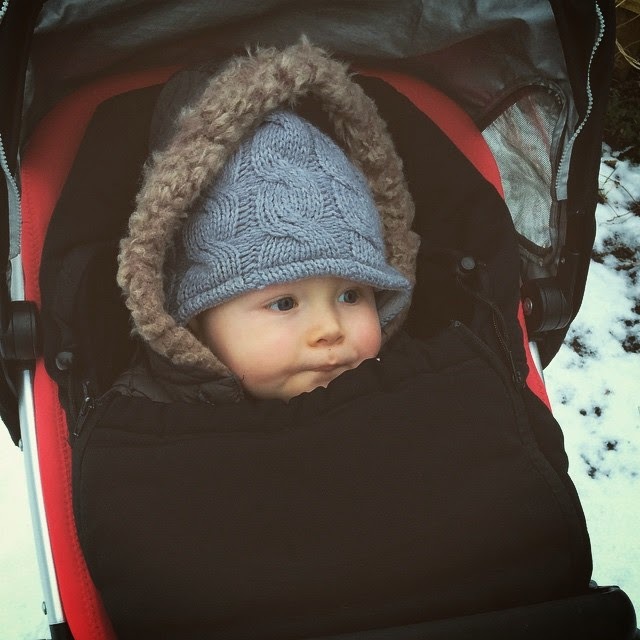 Noah hadn't seen snow yet so it was great to be able to take him out to see it for the first time. 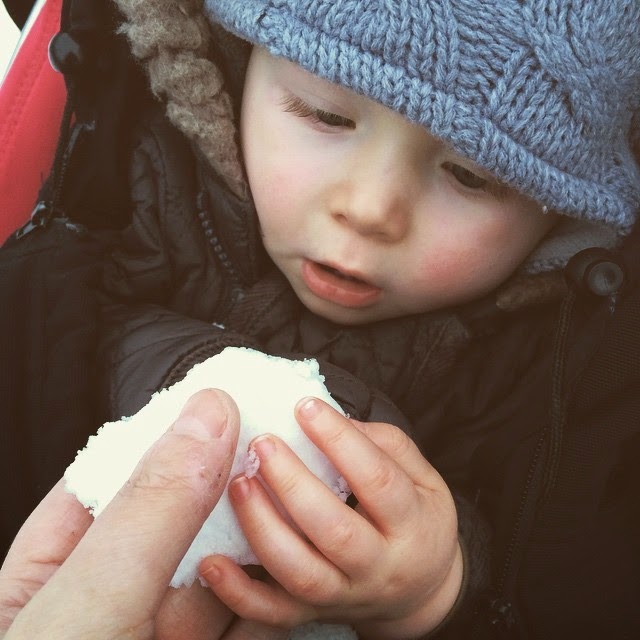 As he isn't walking yet he was sat in the pram so I put together a little snowball for him to explore. He seemed to really like looking at his white topped surroundings and he had a huge smile on his face. It's been another week, another week full of photo's. I'm really enjoying Project 365 and knew I would find it easy to stick to because I do take numerous photo's on a daily basis. What I'm struggling with it deciding on which photo to use everyday because I take that many. 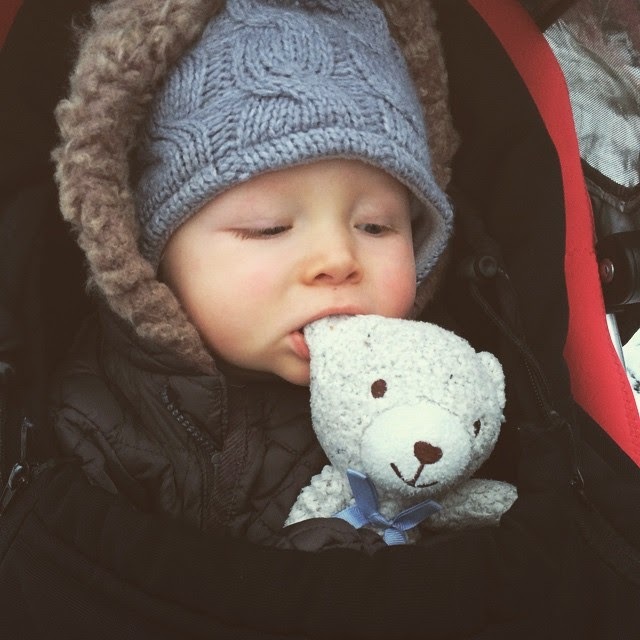 I am also finding that most photo's that I want to use are of Noah too.